Lionel Robbins was much concerned about the methodology of economic science. based on a knowledge of historical fact were taken from monetary economics. Indeed, monetary theory has remained prone to such shortcomings ever since. (4) The standard theory of the evolution of money. Monetary economics can only get better, but it has a long way yet to go. Interaction models - don't get caught! In an award-winning article in the American Political Science Review, Boix (1999) examines the factors that determine electoral system choice in advanced democracies. He makes two main conclusions. First, ethnic or religious fragmentation encourages the adoption of proportional representation in small and medium-sized countries (621). He draws this conclusion based on a model that includes an interaction term between ethnoreligious fragmentation and country size. However, he does not include either of the constitutive terms. When these terms are included, there is no longer any evidence that ethno-religious fragmentation ever affects the adoption of proportional representation (italics added). You should read the article to see other horror stories. The lesson: if your dissertation/paper is riding on an interaction effect, don’t be a fool. Estimate a fully specified model. A salutory lesson. Here is a non-gated version of the Brambor, Clark and Golder paper, Understanding Interaction Models: Improving Empirical Analyses (PDF). NYU's Matt Golder has more useful material on interaction models on his web pages. 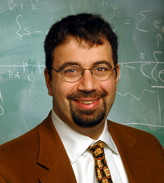 Daron Acemoglu responds by saying blogging "seems like a lot of work." He adds "I am already overcommitted, so it's a bit scary to take something else on." This book grew out of the first graduate-level introduction to macroeconomics course I have taught at MIT. Parts of the book have also been taught as part of a second-year graduate macroeconomics. First and foremost, this is a book about economic growth and long-run economic development. The process of economic growth and the sources of differences in economic performance across nations are some of the most interesting, important and challenging areas in modern social science. The primary purpose of this book is to introduce graduate students to these major questions and to the theoretical tools necessary for studying them. The book therefore strives to provide students with a strong background in dynamic economic analysis, since only such a background will enable a serious study of economic growth and economic development. It also tries to provide a clear discussion of the broad empirical patterns and historical processes underlying the current state of the world economy. This is motivated by my belief that to understand why some countries grow and some fail to do so, economists have to move beyond the mechanics of models and pose questions about the fundamental causes of economic growth. In a somewhat different capacity, this book is also a graduate-level introduction to modern macroeconomics and dynamic economic analysis. It is sometimes commented that, unlike basic microeconomic theory, there is no core of current macroeconomic theory that is shared by all economists. This is not entirely true. While there is disagreement among macroeconomists about how to approach short-run macroeconomic phenomena and what the boundaries of macroeconomics should be, there is broad agreement about the workhorse models of dynamic macroeconomic analysis. These include the Solow growth model, the neoclassical growth model, the overlapping-generations model and models of technological change and technology adoption. Since these are all models of economic growth, a thorough treatment of modern economic growth can also provide (and perhaps should provide) an introduction to this core material of modern macroeconomics. Although there are several good graduate-level macroeconomic textbooks, they typically spend relatively little time on the basic core material and do not develop the links between modern macroeconomic analysis and economic dynamics on the one hand and general equilibrium theory on the other. In contrast, the current book does not cover any of the shortrun topics in macroeconomics, but provides a thorough and rigorous introduction to what I view to be the core of macroeconomics. Therefore, the second purpose of the book is to provide a first graduate-level course in modern macroeconomics. A considerable achivement. Acemoglu asks readers to note that "this is a preliminary draft of the book manuscript. The draft certainly contains mistakes. Comments and suggestions for corrections are welcome." 'Marshall Jevons' of the weblog The Bayesian Heresy alerts us to a new graduate-level econometrics textbook, available free online, by Professor Bruce E. Hansen from the University of Wisconsin. Here is a direct link to the PDF (1.2Mb). This book is concerned with the question: Why do capitalist economies sometimes go very badly wrong? For several decades after the publication of Keynes' General Theory economists thought that they had an answer. But with the resurgence of classical ideas in the 1970's, the key premise of the General Theory, that market economies are not inherently self-stabilizing, has been called into question. Although there has been a recent resurgence of Keynesian ideas under the rubric of "new-Keynesian economics", the models studied by the new-Keynesians are hybrids that incorporate a classical core. New-Keynesian models allow for temporary deviations of unemployment from its "natural rate" as a consequence of sticky prices but they contain a stabilizing mechanism that causes a return to the natural rate over time. In his 1966 book, Axel Leijonhufvud made the distinction between Keynesian economics and the economics of Keynes. By Keynesian economics, he meant the interpretations of Keynes that became incorporated into the IS/LM model and ultimately, into the new-Keynesian paradigm. Leijonhufvud pointed out that the assumption that the General Theory is about sticky prices is central to Keynesian economics but it is not a central argument of the text of the General Theory. This book provides an alternative microfoundation to Keynesian economics that does not rely on sticky-prices. In successive chapters I construct a series of models that build on a single idea. Each of them is constructed around a conventional dynamic general equilibrium model in which real resources must be used to move unemployed workers into jobs using a "search technology". Although this technology is convex, I assume that the planning optimum cannot be decentralized as a competitive equilibrium because moral hazard prevents the creation of markets for the search inputs. As an alternative, I introduce an equilibrium concept called demand constrained equilibrium, in which the level of economic activity is determined by investor confidence or "animal spirits". I refer to the resulting model as "old-Keynesian" to differentiate it from new-Keynesian economics that incorporates the natural rate hypothesis of Edmund Phelps and Milton Friedman. In contrast to new-Keynesian models, those described in this book display multiple stationary perfect foresight equilibria, and there is a different stationary unemployment rate, for each possible level of beliefs.